Come on. 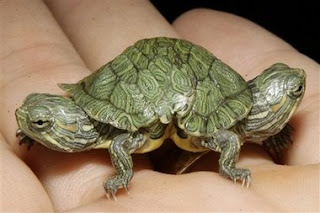 How many chances will you have in life to name a two-headed red slider turtle? AHH! It's so cute! I voted to name it "Gemini". OH MY GOD! CUTENESS!!! Yeah, I voted for "Gemini" too. All of the other names are dinky. wicked. I voted! so cute! Gemini is winning easy. No competition.